Completely restyled, the new Trackmaster models TMX22 and TMX55 are longer, wider, quieter, and packed with user-preferred features. 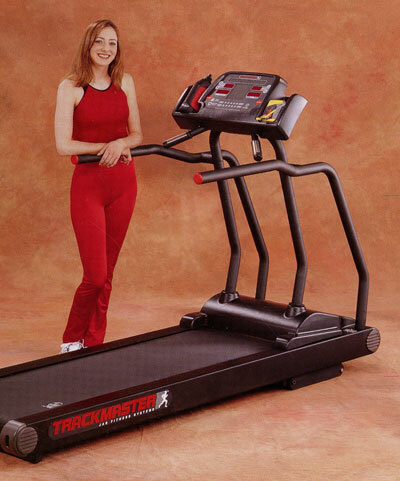 The new 22" wide, 63" long running belt, Trackmaster now provides more running area than any club treadmill in the industry. The double-sided running deck gives years of service and absorbs and dampens even the most punishing shocks better than the previous model. Trackmaster's patented MasterTrack belt alignment system eliminates the need to periodically realign the running belt. The new low-profile hood dampens motor noise and allows easier access for maintenance, while the sleek, restyled frame complements any family's décor or layout. Trackmaster's quiet, reliable AC inverter drive can easily handle users up to 400 pounds without the belt lag you'll find in lesser treadmills. Both Trackmaster models provides both Polar and contact heart rate displays, a part of the most innovative progr ammable treadmill controller anywhere. Our patented MasterTrack® BELT ALIGNMENT SYSTEM keeps the running belt aligned and minimizes wear and saves you from having to regularly adjust the belt.